On Sept. 11, 1973, a military junta headed by Gen. Augusto Pinochet completed a coup against the left-wing government of Chilean president Salvador Allende. Allende had given hope to many leftists around the world that socialism could come to power peacefully and coexist with liberal political institutions. The chaos and tumult of his three year presidency and its violent end seemed to demonstrate the impossibility of such a strategy. Twenty-five years later, however, another Latin American leftist came to power through a mass movement at the ballot box — Venezuelan president Hugo Chavez — and promised a different path towards the same goal. Chavez proposed a less aggressive, more creative path towards socialism, one with more democracy than ever before for the people of Venezuela. The parallels with Venezuela and Chile, however, should prompt far more skepticism from honest observers. The CIA long ago confessed to years of maneuvering to destabilize the Allende government and to coordinate the forces that would bring it to an illegal and violent end. There is ample evidence now that just such a plot is underway in Venezuela today, and that it is very likely to succeed. The best way to tell, in fact, is to study what happened in Chile. The outcome in Venezuela is likely to be very different than what happened in 1973, with major security implications for South America, the Caribbean and beyond. If recent U.S. policy has anything to teach us, it’s that the Venezuelan people may wish that they got off as easily as the Chileans did. Allende’s Unidad Popular coalition, which included the Socialist Party, the Communist Party and several other left-wing parties won a non-majority plurality in the national elections held on Sept. 4, 1970. Almost immediately, according to the CIA’s own internal history, U.S. president Richard Nixon and his national security advisor Henry Kissinger began to plot against the incoming regime. 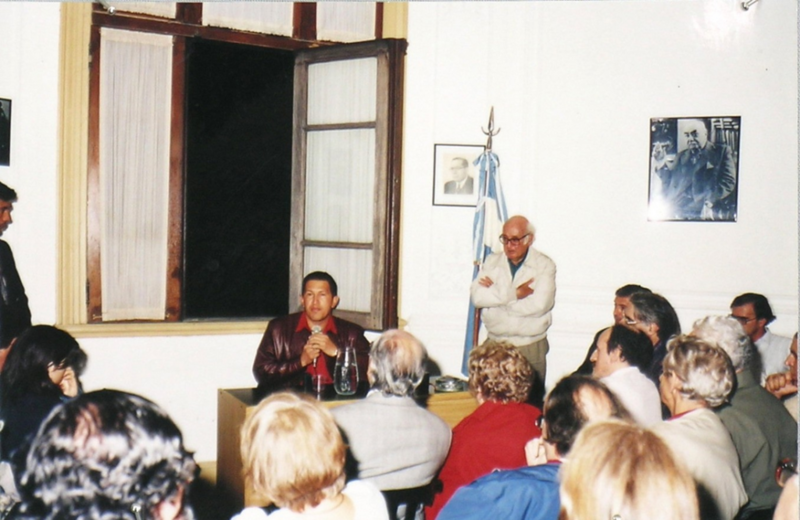 The efforts began with a failed attempt to organize a coup prior to Allende’s inauguration which culminated in the assassination of the constitutionalist commander-in-chief of the Chilean armed forces Rene Schneider. Following this, the CIA used propaganda, political organizing, military efforts and economic sabotage to set the stage for the ultimately successful coup that would arrive in September 1973. By the time their efforts had reached their peak there was no chance for the Allende presidency to survive. Their propaganda campaigns were both internal to Chile and external. The CIA gave the publisher of the nation’s largest and most prominent newspaper El Mercurio $1.5 million to take a hard anti-Allende line. The CIA’s political organizing connected with this by funding opposition parties, giving them a total of $6.5 million and driving them towards ever more intransigent positions against the regime. Most importantly the Agency used the funds to drive the parties into demanding military representation in the Allende cabinet. The CIA also sponsored a number of right-wing think tanks and violent, far-right political organizations. 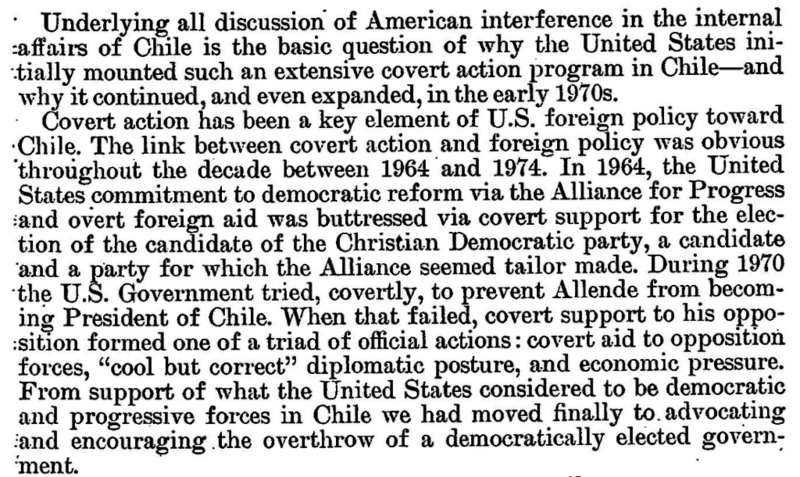 This was in fact a key part of CIA’s military strategy in Allende’s Chile. The CIA gave funding, arms and training to the fascist group Patria y Libertad. The organization went on to commit a series of political assassinations, an attempted nationwide campaign of sabotage and a failed coup in June 1973. The CIA also remained in close contact with regular military officers plotting against the government, assuring them of support. 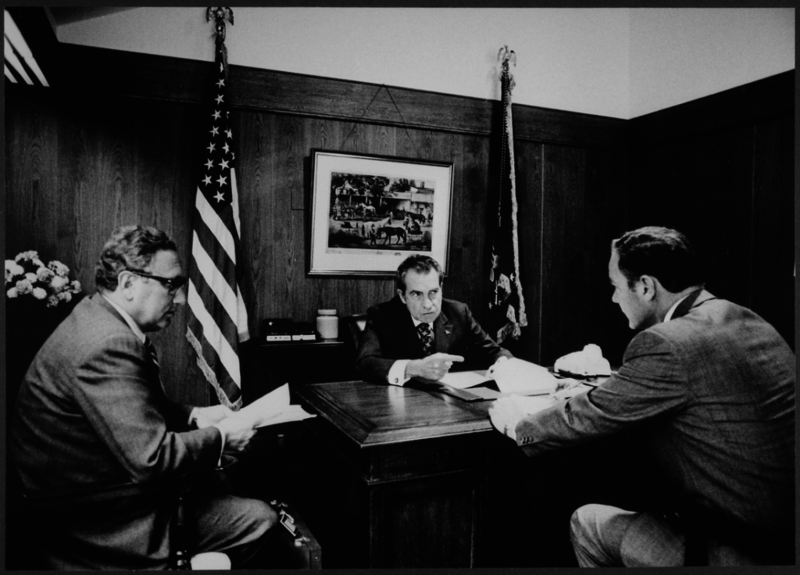 The Nixon administration cancelled all humanitarian aid to Chile, but military aid continued in an effort to cultivate favor with Chilean officers. All of this was underscored by the unprecedented economic warfare carried out by the United States against the Allende regime. The core of this pressure came from a campaign to organize middle class elements to strike and create economic chaos. The American Institute for Free Labor Development, an arm of the AFL-CIO assisted the CIA in this plan. It helped organize truck drivers, shopkeepers, taxi drivers and professionals to go on extended, violent strikes in 1972 and 1973. The trucking strike in particular wreaked havoc on the Chilean economy, causing stores to run empty and economic activity to grind to a halt. The CIA provided more than $8 million of support to the effort, most importantly in the form of classic strike support, paying the salaries of the striking workers. After years of such disruptions, as well as inflation prompted by black market currency manipulation, and an “invisible blockade” against the country, average Chileans had lost faith in their government. Relentless propaganda, violence, and political gridlock eroded ruling class skepticism of a military solution and made it possible for Pinochet to roll into power with a unanimous armed forces and no effective political opposition. His regime quickly liquidated the left forces which might have offered a threat to his rule, and he remained in power for 17 years. So what does any of this have to do with Venezuela? First things first, we can see the importance a single political leader can have in preventing a break with the status quo. In Chile there was a consensus behind respect for the regime until Schneider was killed. At that point there opened a political possibility for a new military politics. In Venezuela the figure of Chavez precluded an overthrow of the government there. We know this for a fact because a coup against him in 2002 lasted a matter of hours before mass uprisings and a lack of support from the military forced the plotters to surrender. Chavez was a controversial figure, hated by significant elements of Venezuelan society, but beloved by a majority of the largely poor country and respected by the military. Chavez announced the return of his cancer in the fall of 2012 and died in March 2013. The current economic crisis kicked into high gear in the late summer of 2012, with inflation — typically high, but manageable — suddenly growing at an exponential rate. The cause typically cited by Western media — a precipitous fall in oil prices — occurred a full two years after the crisis began. The evidence seems to suggest that the terminal decline and death of Chavez prompted an acceleration of economic sabotage against the regime. As for propaganda and political efforts, in both Chile and Venezuela the United States provided direct material support to opposition parties. The U.S. State Department openly gave $14 million to opposition groups in Venezuela in 2013 and 2014 and helped fund political campaigns against the Maduro government. The U.S. Agency for International Development, long thought to be a front for CIA operations, funded an ominously-named “Office of Transition Initiatives” in Venezuela, joining with the National Endowment for Democracy to spend more than $100 million supporting the political opposition there. Note that in both Chile and Venezuela the point of political organizing has not been to defeat the government in elections. It is to sow political chaos and undermine the legitimacy of the government altogether so that intervention becomes justifiable. This is especially clear in Venezuela, where the U.S.-backed opposition has routinely taken a position of boycotting national elections, even ones they probably would have won. Fears that the opposition would not have a fair outcome are belied by the fact that they actually won national elections in 2015. The true purpose, it seems, is to de-legitimize all political processes in Venezuela. This is clear in the outrageously slanted coverage of these processes in the U.S. media, where mainstream outlets present the boycott as the government barring opposition parties, or where they describe elections in which regime opponents refuse to participate as “power grabs” for Maduro. The context for all of this, again, is an awful economic crisis. Western media present this crisis as the fruits of ill-advised socialist policies, but just like in Chile the troubles are very clearly the product of intentional sabotage. Since 2012 Venezuela has faced a twin plague of shortages and rampant inflation. Venezuelan economist Pasqualina Curcio makes the case in her 2016 book The Visible Hand of the Market: Economic Warfare in Venezuela that both phenomena cannot be explained through normal economics, but rather by political causes. The obvious implication is that large quantities of consumer goods are being hoarded somewhere or smuggled out of the country. This also explains why shortages in Venezuela are not created equally. Products that aren’t controlled by large monopolies or oligopolies–things like fruits and vegetables which have many small producers around the country — are not subject to shortages in the same way products controlled by a small number of firms are. Shortages tend to be occur for non-perishable items, i.e. those easily stored or smuggled, and for sensitive consumer products such as hygiene products or consumer staples — not luxuries enjoyed by the wealthy. Most damning of all perhaps is the way that consumers face shortages that commercial customers do not — for example consumers could not find flour in any stores at the same time commercial bakeries had plenty. Curcio also demonstrates how shortages peak at election times and during other sensitive political moments, not in conjunction with any economic or policy changes. As for inflation, the factors typically involved with currency devaluation–a shortage of foreign reserves or increased liquidity–have not coincided with inflation spikes. Nor has the state hoarded foreign currency as many claim. Curcio shows that 94 percent of foreign reserves were distributed to the private sector, and these distributions have grown over time. To be sure, the Maduro regime has responded to this crisis very poorly, exacerbating the problems at hand. This then has been the pretext for violent street protests, some of which have murdered police and other public servants. Organizations sponsored by U.S.-funded NGOs are the ones calling for these protests, and the U.S. media presents them as “crackdowns” by the Maduro government, further delegitimizing his rule. It’s in this context that we now see the U.S political elite calling openly for “intervention” in Venezuela. Maduro is in a terrible position, as he can either address the root causes of the problem by liquidating the country’s ruling class — surely prompting rapid intervention from the United States, Colombia and other reactionary elements — or he can let the status quo drag on until elements in his country overthrow his government. Allende faced the same conundrum, and we know how that ended. In Venezuela it is likely to end much worse. Chavez’s legacy of special treatment for the military and the more explicitly nationalist elements of Maduro’s rule make the kind of consensus military break with civilian rule seen in Chile less likely. Civil war is a strong possibility, with protracted military violence and mass displacement of millions. In Iraq, Afghanistan, Syria and Libya the United States has shown an eagerness to destroy countries before allowing them to burn indefinitely. Setting such a fire in the Americas could be very useful for U.S. imperial power in the region, an example for others that may choose to challenge our corporate elites. Finding a place for millions of refugees in a region throwing up barriers to entry as fast as possible is likewise liable to prompt a myriad of unforeseen consequences, as will the prospect of complex intrigue over Venezuela’s oil riches. The one thing that’s certain is that the folks beloved by Chavez — the poor and forgotten of Venezuela — are in serious trouble. Chile has seen generations of yawning inequality and periodic economic privations since Allende’s ouster. Unless Venezuela’s political leadership can consolidate its position, restore its mass base, expropriate and suppress its current ruling class and establish a new system of government by and for the working masses — all while avoiding direct military attack from the United States or its allies — it will get all of that and worse. The indications are not good right now, and it is incumbent upon U.S. citizens not interested in mass murder for the sake of Wall Street to demand the truth about Venezuela and to compel the media to present a more diverse array of views on this complex situation. Until then we must educate ourselves so that unlike the people of Latin America we might not be doomed to repeat history yet again.